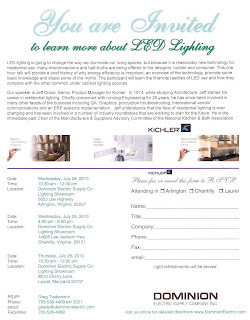 Have you ever wanted to learn more about LED lighting? Well you're about to have an opportunity to do so! 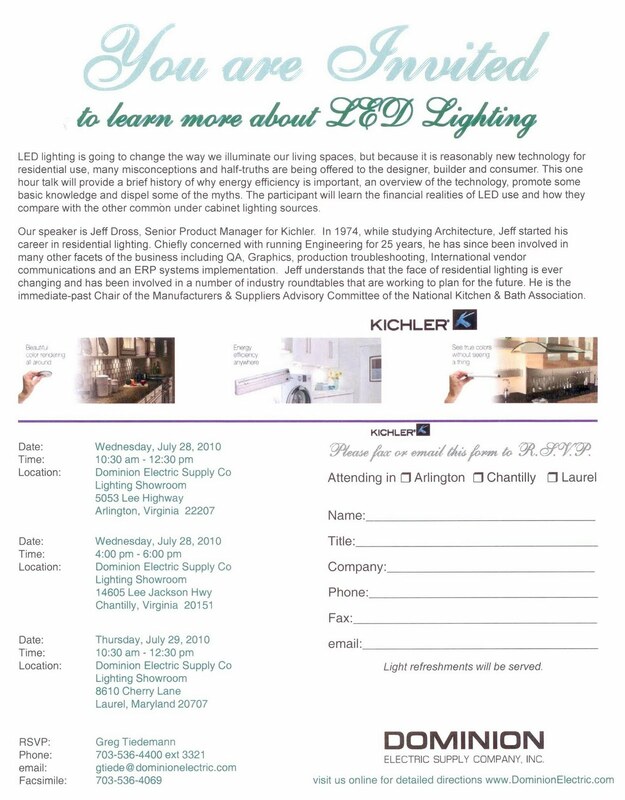 We are honored to have Jeff Dross, Senior Product Manager for Kichler Lighting hosting our seminars on July 28th and 29th. He's his bio: In 1974, while studying Architecture, Jeff started his career in residential lighting. Chiefly concerned with running Engineering for 25 years, he has since been involved in many other facets of the business including QA, Graphics, production trouble-shooting, International vendor communications and an ERP systems implementation. He is currently Senior Product Manager concentrating on Systems Lighting and their Energy Efficient lines. He also serves as trends analyst and often-quoted media spokesperson. Jeff understands that the face of residential lighting is ever changing and has been involved in a number of industry roundtables that are working to plan for the future. He is the immediate-past Chair of the Manufacturers & Suppliers Advisory Committee of the National Kitchen & Bath Association. He will start in Arlington on Wednesday July 28th from 10:30 to 12:30. Then we'll have him in Chantilly on the same day from 4:00 to 6:00. He'll finish up in Laurel on Thursday July 29th from 10:30 to 12:30. The seminars will be geared to designers, architects, and contractors, but all are welcome to attend. We just ask that you RSVP so we can have a head count for our caterers (yes, we'll have food!). You can email me at cschla@dominionelectric.com if you are interested, or if you'd like more information. We hope to see you here!